A Kitchen / Bathroom Designer is in business to make your home design dreams come true. Your Kitchen and Bathroom designs are some of your homes most visible areas to don’t wing it. Your cabinets, color palette, lighting, plumbing, and flooring all play a part in your final design and it’s best in bring in a professional to help you. 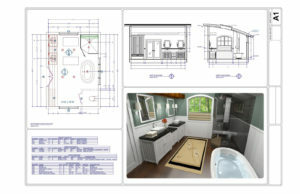 A Kitchen/Bathroom Designer can help you define and design the scope of your project, including the determination of a budget, offering a selection of products, generating a plan for the installation, the execution, and the follow up. What do you want out of your new Kitchen/Bathroom? What are your main objectives and aspirations for your dream room? Now’s the time to think of what past rooms have lacked, what you’ve always admired about others’ rooms and/or what you’ve always imagined your room could be. Your notions will lead to priorities that will drive the remaining parameters on budget, style, products and more. So, give this step some time and think it through well—include the family or other household members about their preferences. What you conjure up in step one will primarily determine how much you will need to spend on your new bath or kitchen. Here’s where a solid designer/maker can help you draw up a range of costs for your ideas. This will include sourcing out potential materials, fixtures and other services and providers necessary. Start to think about how to best use your space in terms of functionality and where any obstacles might be in a flow plan, thinking up, down and around as you go. Consider your day and night routines in your new bathroom/kitchen and how the room could WORK for you. While doing this, infuse the style/look/concept and how that might change any functional aspects—or ENHANCE the room! Sometimes a unique look can lead to a great opportunity and visa versa. A designer/maker can offer, again, all sorts of design and style guidance in addition to what you can find on your own. AND THEN, we draw up the working plans based on this. Then it’s time to select all the products that your room requires. As they say, the devil is in the details; but, you’ll find that your new room is closer to heaven when you do this thoroughly and accurately. The style/design you have selected will help dial down to the right choices/categories so that it might be as easy as pointing at catalogs or websites. Often, you or a designer/maker will bring more to the table in terms of customization and unusual products than what can be found in the general offerings. Make Way for the Install! Now, it’s up to us to put the plan into motion! Whether we’re refreshing a room or doing a total re-do, the plan will include what to expect as members of the household: where you can go, what of the room (if any) you can use, etc. And we will work with all the suppliers and contractors to make sure that not only the job is done exactly to plan but in consideration for the tenants—you! You’re in! File all receipts, contracts, warranties and product info and make sure you know how to operate and maintain your new fixtures, products and such. Hopefully, you’ve built in a special place JUST for all that! Enjoy!